Charter Bus Rentals Traveling Nationwide | National Trails, Inc.
For over 35 years, National Trails has been a trusted name in charter transportation. With our friendly staff, experienced drivers and modern vehicles, we're the best choice for your group transportation needs! Our 56-passenger buses are fully-stocked with the latest amenities and comfortable seating so you can ride anywhere in the United States in complete comfort. Whether you're planning a night on the town, a class trip to Cedar Point or a cross-country trip - we've got you covered. We offer competitive rates and customized packages designed to fit any plan. When it comes to bus charters, Southeast Michigan has been trusting National Tours for over three decades. Why Choose National Tours for Your Bus Charter? Licensed nationwide - we travel anywhere in the continental United States. No independent contractors - all drivers are our direct employees. Detailed screening - our drivers undergo regular drug testing and background checks. 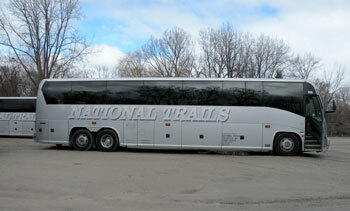 Luxury vehicles - our buses feature comfortable seats, bathrooms, Wi-Fi and electrical outlets. Competitive rates - get a custom quote for any travel needs. Large capacity - our buses can transport up to 56 passengers. Climate-controlled - travel in comfort with adjustable heating and air conditioning. Tour Bus, Party Bus, Any Bus...You Need it, We've Got It! Our vehicles are perfect for any type of event. Casino Trips - National Trails offers chartered trips to Michigan's most popular casinos! Whether your group wants to take a day trip to Soaring Eagle or a night hopping between Motor City, MGM and Greektown Casinos, we have affordable packages to meet your needs. Amusement Parks - No summer is complete without a trip to Cedar Point! Whether you're planning a class field trip, a church outing or just getting together with a group of friends, we'll take you to America's Roller Coast in comfort. Sports Games - Detroit isn't just known for its cars, it boasts some of the best stadiums, ballparks, arenas and sports teams in the country! Next time you're getting a group together to go to a game, contact National Trails to experience the area's best transportation. Reserve your charter bus today! Give us a call at (248) 353-9510 or request a quote online to get started.